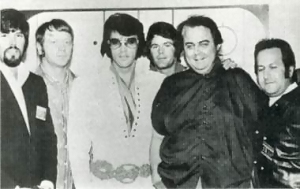 Elvis Presley invited the quartet to sing backup during his series of Las Vegas concerts. After those shows, Houston says, ‘we would jam with him for an hour, singing gospel. He really loved it, had a feel for it and was tickled to have four ‘church sisters’ backing him up’. 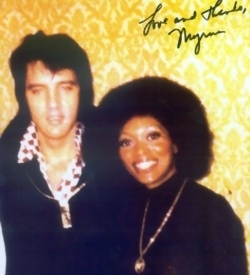 As a token of his appreciation, Elvis presented Cissy Houston with an engraved bracelet on he outside with her name and on the inside with his pet name for her Squirrelly. Despite their touring success of the Sweet Inspirations , Houston longed for the comforts of home. 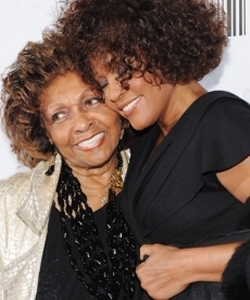 ‘I don’t know if the road was really for me’, says Cissy Houston. Myrna Smith: I was married to Jerry from 1982 to 1987 and we’re still good friends. Jerry and I started dating in 1973 and so I got a chance to spend more time with Elvis than others. I flew on Elvis’ plane, spent time at Graceland and usually stayed on the same floor as Elvis in the hotels when were on tour. In California I would stay at Elvis’ house on Monovale. Myrna Smith: We got a call from our booking agency who said that Elvis had phoned wanting us to sing with him. At the time we weren’t that impressed as they sent us what seemed like 200 albums of songs to learn since we weren’t that familiar with Elvis’ material! 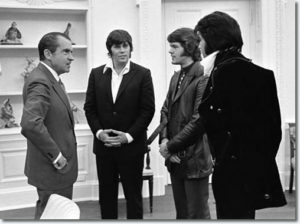 This was 1969 when Elvis had been recording those movie soundtracks and the older songs like ‘Teddy Bear’ & ‘Love Me Tender’ just wasn’t the type of music that we listened to. After days of arguing, Priscilla convinced Elvis that Lisa would be happier with a constant parent, rather than one that was on the road. Touring most of the year, much to his despair, Elvis had to concede to the truth of his usual life-style was not conducive to raising a child on his own. Although, “Elvis just stood watching as we load up Priscilla’s blue Mercedes. By than Priscilla was in tears and shaking,” says Schilling. “This day was strange, and Lisa knew it. 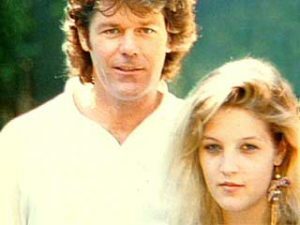 She looked into her daddy’s eyes and asked him, ‘Are you crying, daddy?” At the point, Elvis flashed Priscilla a look that could kill, then delivered Lisa into her mother’s awaiting arms, turned on his heels, walked back into the house, without looking back. Footnote: In regard to my personal experience I find Elvis always willing to talk to me if I had a problem. He always treated me as if we were the same. Elvis was a deep person. He would admit to the same insecurities that I had. I remember he told me that things weren’t so different for him… sure success, fame, and money gave him the opportunity to have nice things, and buy the things he wanted, but it didn’t stop him from having doubts or fears. Elvis was a very caring person. I remember when I once had I car accident. I was pretty shook up, but nothing real serious. That night I found it difficult to fall asleep. Elvis somehow knew that, and came into my room (we were all in staying with Elvis during the shooting of Frankie and Johnny and talked to me until I fell asleep.